Millions of different products are bought and sold on Amazon on a daily basis and listed through the Amazon Seller App. The online retail behemoth has provided more opportunities for sellers and buyers to get the best deals and services at both ends of the spectrum. It has given rise to a new kind of online entrepreneur and provides the support and tools for success. Amazon gives sellers a huge platform and a global reach with millions of people around the world. Another great tool for sellers is the Amazon Seller App. In order to start selling on Amazon, you need to set up an Amazon seller account. You can go to sellercentral.amazon.com to register. The process of setting up an account takes a few minutes. Once you have registered as an Amazon FBA seller, you should download the Amazon Seller App. This app is completely free to download from the Apple store or Google Play store for Android. The app allows you to turn the camera on your phone into a scanner that you can use on any product's barcode to get a price/ fee information from Amazon. With the Amazon seller barcode scanner, you can go out to find the best products to sell on Amazon. The app will give you valuable information such as selling price, fees and other details on products sold on the Amazon site. People sell all kinds of things on Amazon from unused household products to books, clothes and gifts that were received but never opened. The other way of doing things is to buy items on sale from retailers. The trick is to find items that are selling for less elsewhere than they are on Amazon. Buying items for a low price and selling them on Amazon at a higher price is also known as retail arbitrage. You can go to your local Walmart, Home Depot or any other big box store to find items that are on sale. Clearance sales are the best way to get products. Once you are in the store, open the app and use the amazon seller app scanner feature to scan a barcode. You will then get a screen on your phone that shows two things: selling eligibility section and sales rank. The app will let you know whether you are eligible to sell a specific item and learn how fast the item is selling on Amazon via sales rank. The general rule of thumb when it comes to sales ranking is to look for products with a ranking lower than 150,000. On the financials section of the app, you will be able to see the return on investment on a particular scanned product. The app will give you a net profit number which you can compare to your minimum profit threshold. You can set your minimum profit cap, but make sure you chose an amount that will allow you to withstand small price drops without wiping your entire profit out. What else can you do with the Amazon Seller app? View competing offers, estimated profitability, and read customer reviews. 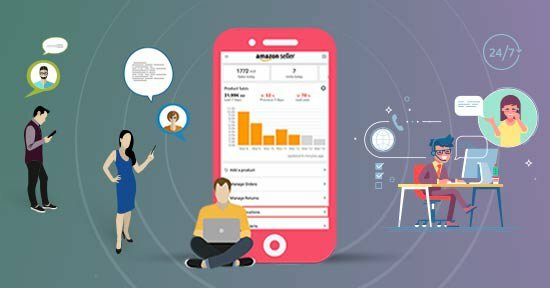 All in all, the Amazon Seller App exists to make your life as an Amazon FBA seller that easier. It lets you run your business conveniently on your phone.